There is nothing more important for organizing our time than a great calendar/planner. You can use this tool to incorporate planning as well. The strategy of not only recording dates can be the key to making your life more organized and less stressful. Choose a calendar/planner that works for you. 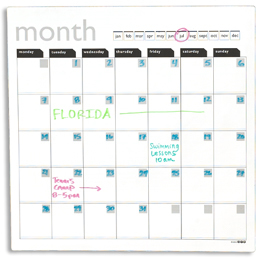 It’s a calendar/planner that makes it easy to record dates at any time. It also helps you view time the way you think about time, at a month at a time, throughout a week, or just in a long string. Your calendar can be as simple as a yellow pad, very exact like Franklin Covey planners, or with technology on your smart phone. Create a habit of recording dates as soon as possible. There are always lots of dates swirling n your head for you and your family. By entering these on your calendar/planner asap, you won’t have to remember them, there will be fewer conflicts of dates and activities, and you will start to grasp a greater sense of due dates and upcoming events. Refer to your calendar/planner diligently. How often? At least in the morning and evening, but also throughout the day to keep you on track with appointments and projects. Use your calendar as planner for big and little tasks. Breaking down big projects with your own time line, creating accountability dates to complete a project, and adding in baby steps makes your planner a strategy to get things done. Post a family calendar for your kids and partner to add dates. Keeping everyone in the loop and keeping everyone communicating keeps your family organized. Have a weekly review to get ahead of the game. Once a week, make a date with your calendar to look ahead, see what is coming, prioritize and get in gear. Using a calendar/planner eliminates the mental clutter of remembering dates and times and helps you focus on completion of a project. The more you use your calendar/planner, the more indispensible it will be!